Vocational Service is one of the Five Avenues of Service of Rotary International. To acknowledge this service avenue the McMurray Rotary has established an annual Vocational Awards competition for businesses in our community who not only provide outstanding services in their field, but also are good business 'citizens'. We ask the community to assist in this process by nominating businesses they believe embody the Rotary motto of "Service Above Self". All members of our community are welcomed and encouraged to nominate a business for the McMurray Rotary's Business of the Year competition. The criteria are that the business not only performs exemplary service in its field, but, more importantly, actively gives back to our community. We are looking to recognize businesses that operate under the tenants of the Rotary Four Way Test, and that work to make our community a better place for all our citizens! All materials and photos, unless otherwise specified, copyright of Rotary Club of McMurray. All Rotary marks, logos, and copyrighted content is owned by Rotary International, used with permission. 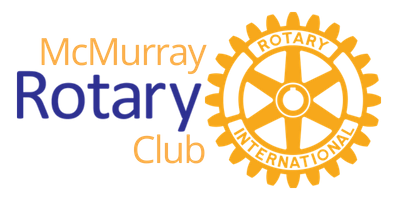 The Rotary Club of McMurray is organized as a federal tax-exempt social welfare association under Section 501(c)(4) of the Internal Revenue Code and as a result contributions made to the organization are not considered tax-deductible charitable contributions. Advertising and the expense of club dues paid to The Rotary Club of McMurray by a business organization may be eligible for deduction as business expenses. Please consult your tax accountant regarding the tax-deductible nature of such payments.